Make Classic Cha Chaan Teng Style Instant Pot HK Onion Chicken (Chinese: 洋葱雞扒) with a few simple ingredients! 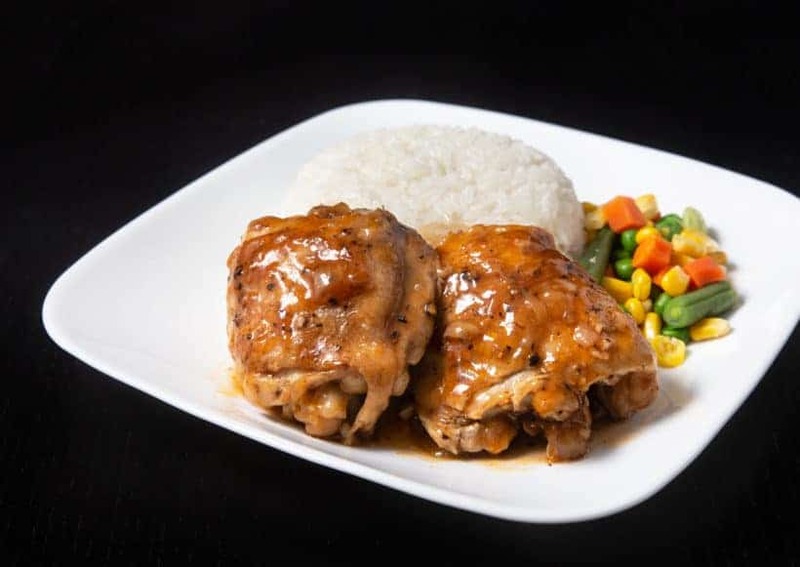 Tender & juicy chicken drizzled with delicious black pepper onion sauce. Comforting super quick & easy busy nights chicken and rice family meal. Jacky & I love to explore different cultures through taste because food means so much more than just filling our tummies with nutrients. 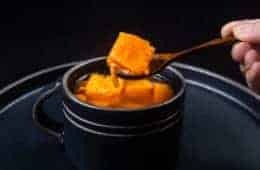 Food actually preserves memories & emotions, while it expresses creativity, identity, history, and culture. What’s amazing about food is its’ mystical power to transport you to other places or back to the past. Cha Chaan Teng (Chinese: 港式茶餐廳), aka Hong Kong Style Cafes, bring us the comfort of home, the fond memories of childhood, and the taste of who we are. 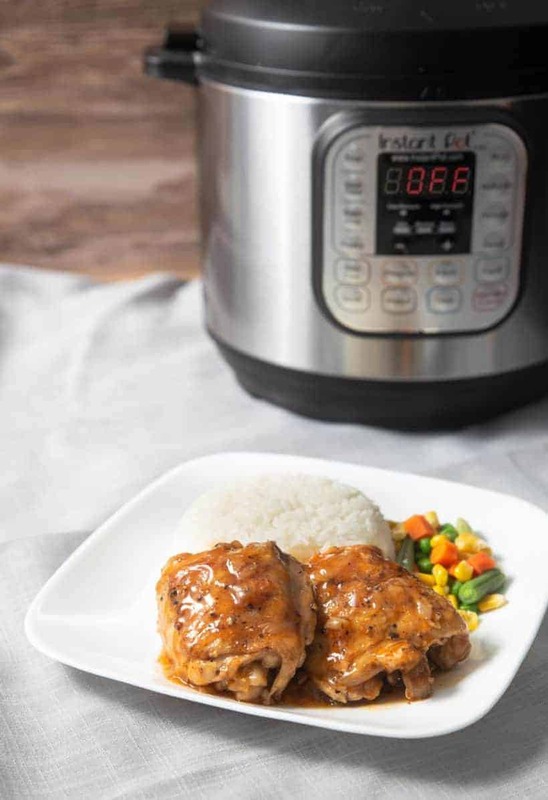 Have fun cooking & enjoy this Classic Instant Pot HK Onion Chicken! Make Classic Cha Chaan Teng Style Instant Pot HK Onion Chicken with a few simple ingredients! 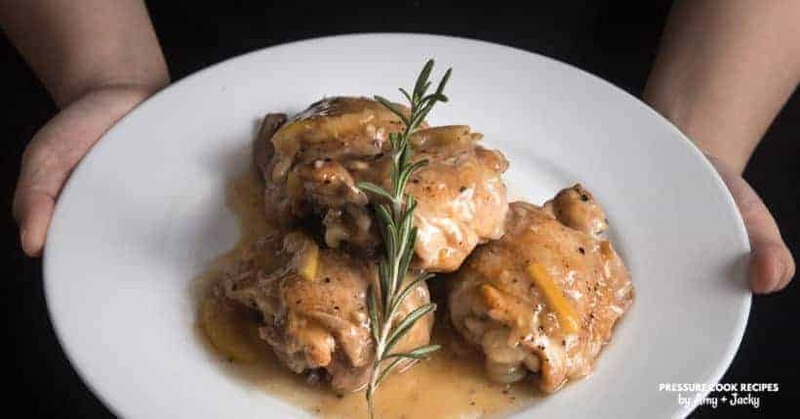 Tender, juicy chicken drizzled with delicious black pepper onion sauce. Comforting super quick and easy busy nights chicken and rice family meal. 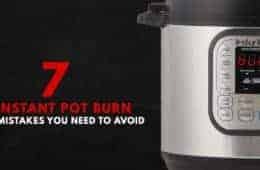 Brown Chicken Thighs or Chicken Breasts: Heat up Instant Pot using Sauté More function. Wait until it says HOT. Pat dry chicken with paper towel and season one side gently with salt + black pepper. Add in 1 tbsp (14g) unsalted butter, then quickly add in chicken to prevent the butter from burning. While one side is browning, season the other side with more salt + black pepper. Brown first side for 3.5 minutes, then the other side for 2 minutes. Set the chicken aside. Saute Onion & Garlic: Add in sliced onion, then saute for 3 minutes. Add in chopped garlic, then saute for another 30 seconds. 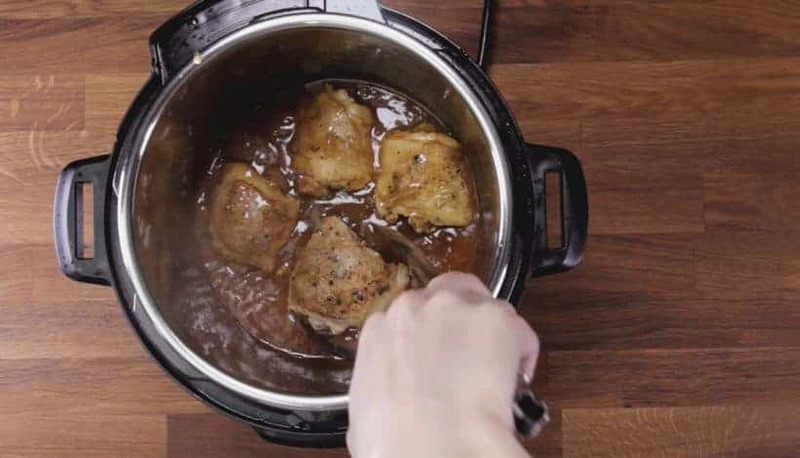 Deglaze Instant Pot: Pour in ½ cup (125ml) unsalted chicken stock, then deglaze by scrubbing all the flavorful brown bits off the bottom of the pot with a wooden spoon. Give it a quick mix. 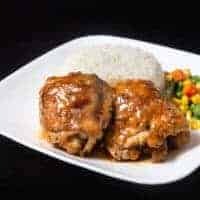 Pressure Cook HK Onion Chicken: Add 1 tbsp (15g) tomato paste, 1 tbsp + 1 tsp (20ml) regular soy sauce, 1 tsp (5g) sugar, and 1 tsp (5ml) Worcestershire sauce. Give it a quick mix. 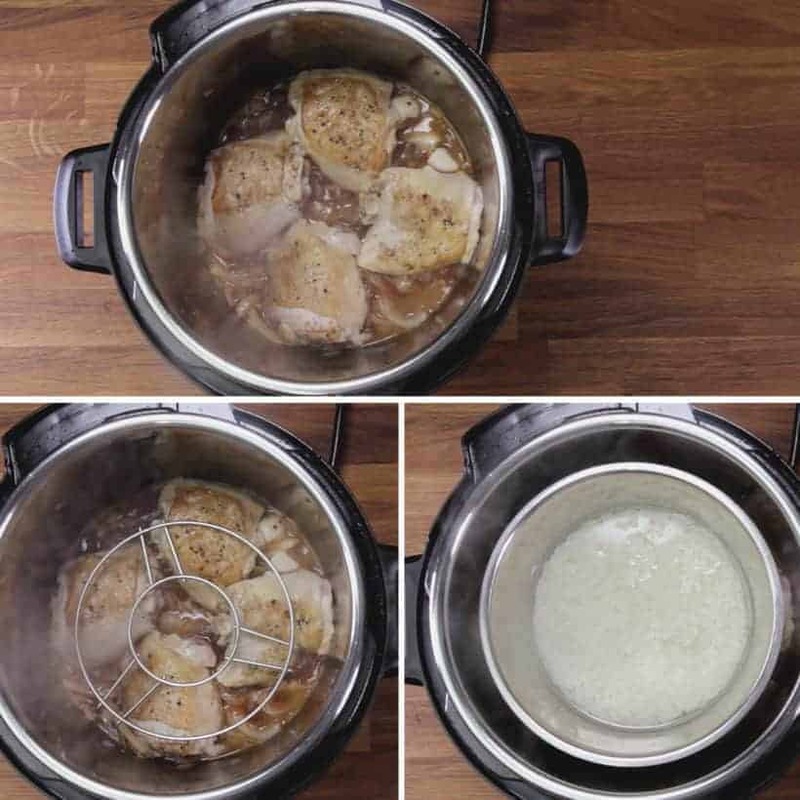 Add browned chicken back into the Onion Sauce.If you want to cook rice at the same time - Use Pot-in-Pot Method: Place a trivet in Instant Pot, then layer a stainless steel bowl with 1 cup (230g) Jasmine rice + 1 cup (250ml) cold water. 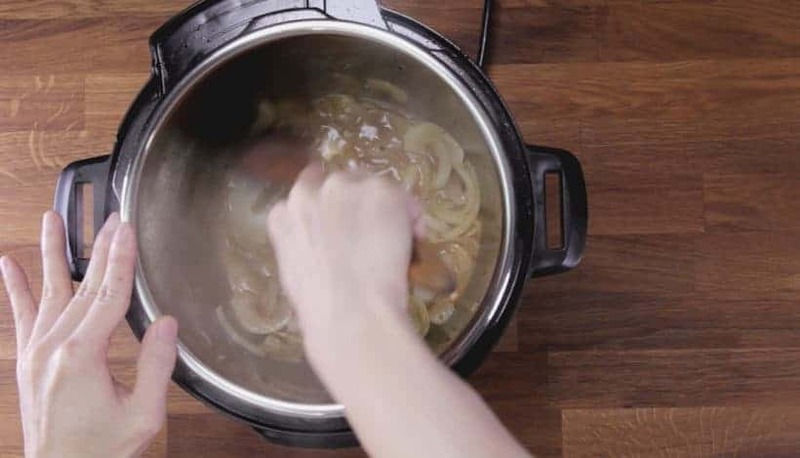 Thicken Onion Sauce: Set aside the bowl of rice, trivet, and chicken. 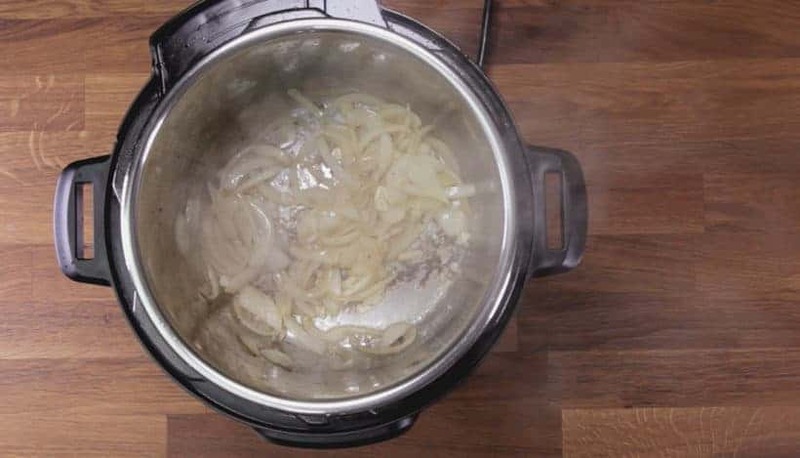 Bring the onion sauce mixture back to a boil using the "Saute" button. Add 1 cup (200g) frozen mixed vegetables in the onion sauce to heat them up. Mix 2.5 tbsp (22.5g) cornstarch with 3 tbsp (45ml) cold water in a small mixing bowl. Add the cornstarch mixture one third at a time to thicken the onion sauce until desired thickness. Taste and adjust seasoning with more salt (For Reference: we added 2 pinches of salt). 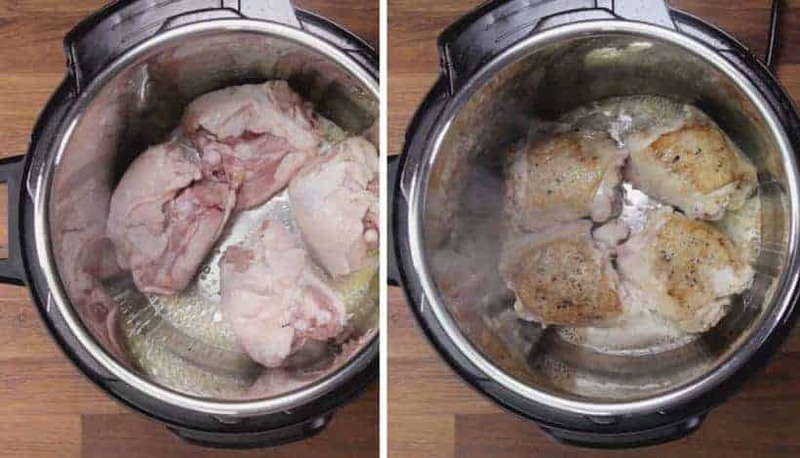 Prepare Ingredients for Instant Pot HK Onion Chicken. Wait until it says HOT (takes roughly 8 minutes). This prevents the chicken from sticking to the pot. Add in 1 tbsp (14g) unsalted butter, then quickly add in the chicken to prevent the butter from burning. Add in sliced onion, then saute for 3 minutes. Add in chopped garlic, then saute for another 30 seconds. 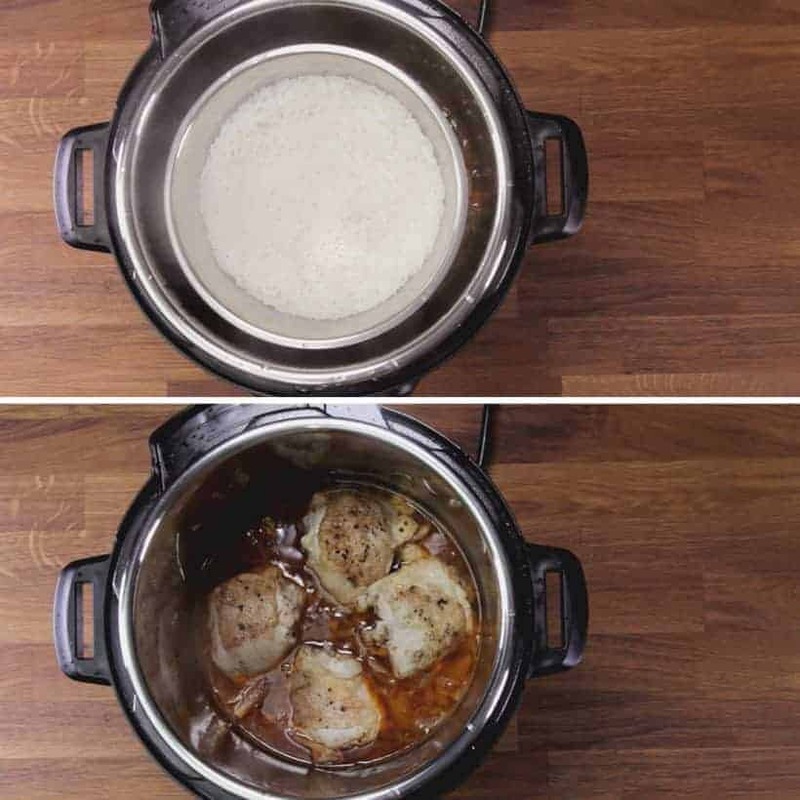 Pour in ½ cup (125ml) unsalted chicken stock, then deglaze by scrubbing all the flavorful brown bits off the bottom of the pot with a wooden spoon. Give it a quick mix. Add 1 tbsp (15g) tomato paste, 1 tbsp + 1 tsp (20ml) regular soy sauce, 1 tsp (5g) sugar, and 1 tsp (5ml) Worcestershire sauce. Give it a quick mix. Add browned chicken back into the sauce mixture. If you want to cook rice at the same time, use the Pot in Pot Method: Place a trivet in Instant Pot, then layer a stainless steel bowl with 1 cup (230g) Jasmine rice + 1 cup (250ml) cold water (as shown in below photo). After 10 minutes, release remaining pressure by turning Venting Knob to Venting Position. Open the lid carefully. Set aside the bowl of rice, trivet, then place the chicken thighs on a serving plate. 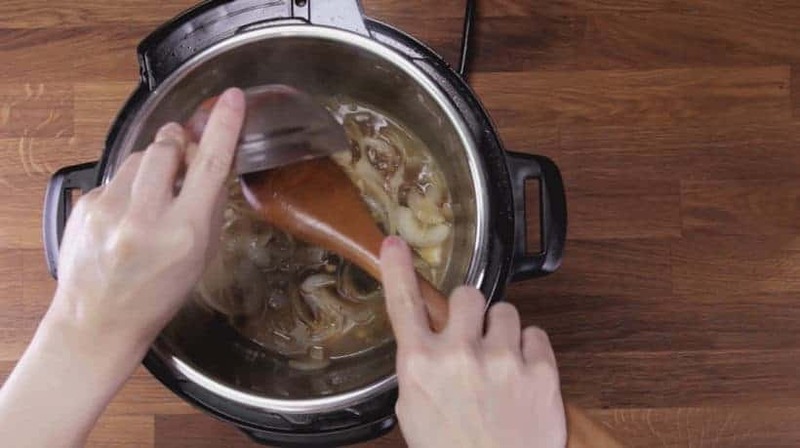 Bring the onion sauce mixture back to a boil using the “Saute” button. Add 1 cup (200g) frozen mixed vegetables in the onion sauce to heat them up (or you can heat up the vegetables on the stovetop). Mix 2.5 tbsp (22.5g) cornstarch with 3 tbsp (45ml) cold water in a small mixing bowl. Add the cornstarch mixture one third at a time to thicken the onion sauce until desired thickness. Taste and adjust seasoning with more salt (For Reference: we added 2 pinches of salt). 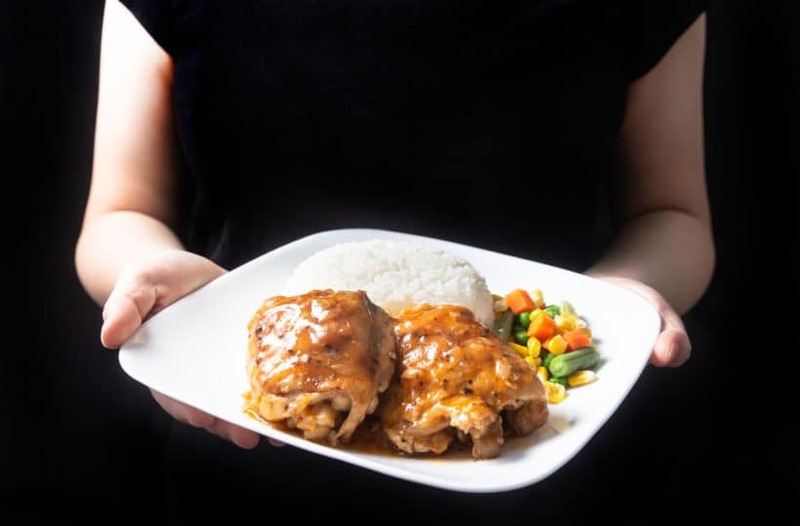 Serve the HK Onion Chicken in “Cha Chaan Teng” aka Hong Kong Cafe Style: add rice on a plate, mixed vegetables on the side, and layer the chicken beside the rice, then drizzle some HK Onion Sauce on top of the chicken. I have 6 chicken thighs. How long should I cook them? By the way, I love your recipes! I recommend reducing the cooking time by a minute. Make sure the chicken thighs are partially submerged in the liquid. Hi Amy and Jacky! I’ve been trying many of your recipes for a while now, every one a gem! Thank you for your great work. For this recipe: I like to cook once for my family, and have leftovers… If I want to 2X the recipe, should I just double everything? Anything else I should be aware of, or tips? Thanks in advance! For the liquid ingredients, I recommend 1.5x and for the rest I recommend 2x-ing them. 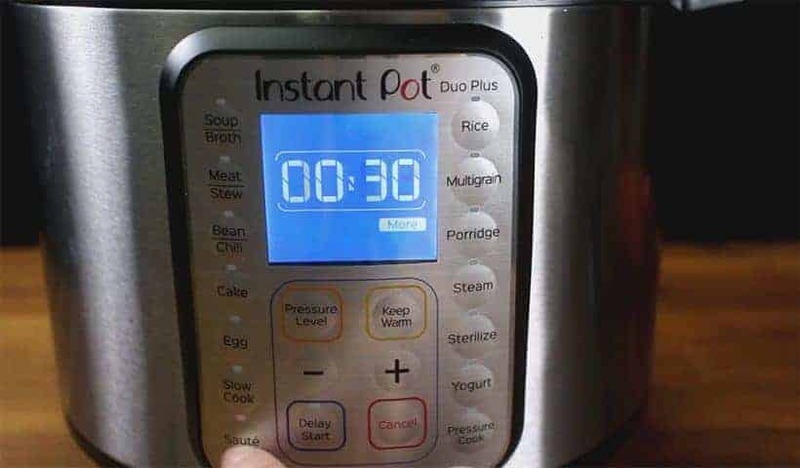 The cooking time can be reduced by a minute as the get up to pressure time will be longer. My initial attempt at using my instant pot. Made this twice and it has become a favor of my wife and myself. Adjusted to suit our tastes-added about 1” of thinly sliced ginger. Used one cup of unsalted chicken broth for more gravy. Fantastic. How will this turn out if I skip the browning , would it turn on out still tasting ok? Success. First successful recipe. My wife and I enjoyed the succulent chicken legs and we are glad we made extra rice which went well with the gravy. Simple to make with everyday ingredients. Happy to hear your wife enjoyed it as well. I was honestly shocked when I read someone found it bland?! I feel like I’m eating a different dish than them because I found the HK onion sauce exceptionally tasty and savory. I’ve been wanting to try this one for a while, but didn’t make it because my husband is a picky eater. But he ate it and said it was different but really good! It will be definitely be in my regular rotation! Thanks again for a wonderful recipe and the work you put in to test them to perfection! Happy to hear your husband enjoyed it as well! Thanks! I will try quinoa next time! Also…if I use skinless boneless chicken thighs would that take a minute off the time? And if I use a glass bowl instead of a steel bowl add a minute? So then a net zero change to the timing overall? Thanks for this recipe…it worked out well! Can I substitute quinoa for rice using the PIP method? Quinoa works great in PIP as well! 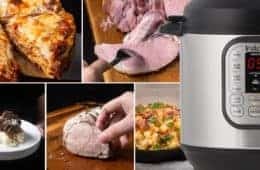 I wanted to make the onion chicken today but can I make it in a Bella 8 qt pressure Cooker. I want todo the pot in pot with the rice. 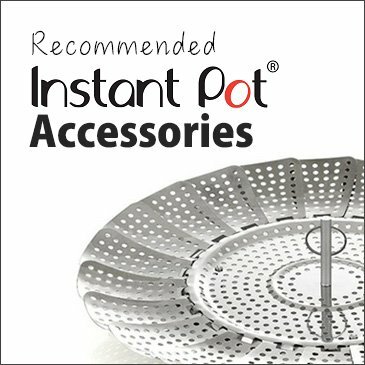 I broken my instant pot lid top and now waiting on my replacement. My husband got me a Bella until my lid top come in. Sorry for the late reply. 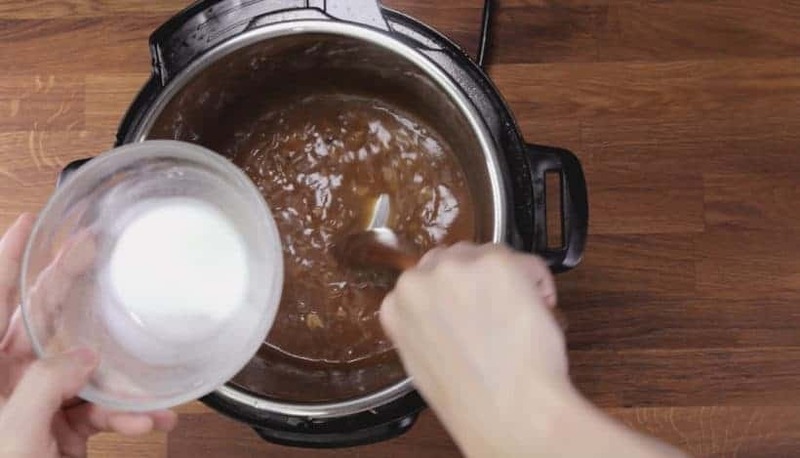 This recipe will work just fine in the Bella 8 quart pressure cooker. I made this tonight with chicken tenders and Basmati rice, using 5 minutes. I enjoyed this and think it would be more flavorful with thighs as in your original recipe. I will make it again soon. Happy to hear you enjoyed the result with chicken tenders as well! This recipe was one of my favorite it was so good I have cooked it three times. This time i’m Trying it with chicken breast. I saw where you Said to cut back one minute. I’ll try that. Please take care & have an amazing week! If I want to make 8 chicken thighs, do I double ingredients for the sauce and do I need to adjust the cooking time? 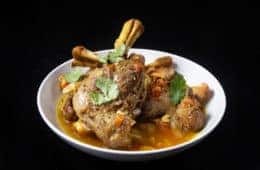 I made this before with drumsticks and added some fresh shiitake mushrooms sautéed in butter to the sauce and it was really delicious! You can 1.25x the seasoning ingredients while keeping the chicken stock the same. The cooking time will be the same as well! Will cooking time vary if I use frozen chicken thighs? You will probably want to increase the cooking time by 2 – 3 minutes for this recipe. Do you think you can use drumsticks with this? The recipe will work for drumsticks. It will take 2 minutes longer. If i wanted to do this with chicken breast , how much time should i do? It will take a minute less. Just made this, and it’s so good! The only changes I made were to take the skin off the chicken thighs and to use xanthan gum to thicken the sauce, as I need to keep my carbs down. I ate the leftover sauce on my plate with a spoon, it was so tasty! I like how the onions kind of dissolve during cooking. Made this tonight. I trimmed the excess fat and skin off the thighs, left out the frozen veg and made some soy-honey glazed carrots instead. Did pot-in-pot Jasmine rice. The recipe came out well and was good, but a little bland for our taste. I understand it’s a comfort-food memory, but I wanted a hit of some spice. I’ll probably make again but add chile, up the garlic, maybe add additional black pepper and white pepper. We had leftover rice and gravy which I’m looking forward to for breakfast with a nice fried egg on top! Can you make other types of rice with this method? No rinsing surprised me, too. Hi Jacqueline, thank you for your honest feedback. Adding more salt will usually open up the flavor more. You can make this with other type of white rice such as Basmati rice. You can rinse the rice beforehand as well. We usually do that unless we are testing a recipe. This recipe looks delicious and easy. Thank you for such great directions. 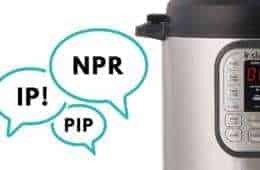 I own a 3qt Instant Pot. To make this recipe, would I divide the recipe by 1/2? This recipe will work just fine in the 3 quart Instant Pot (maybe without the rice). I have to try this. I’m trying to lose weight and have been counting calories. This will work great for me. 22 lbs down, 35 to go! This sounds delicious. Do you think it would work with boneless, skinless chicken thighs? Thank you for your kind words. 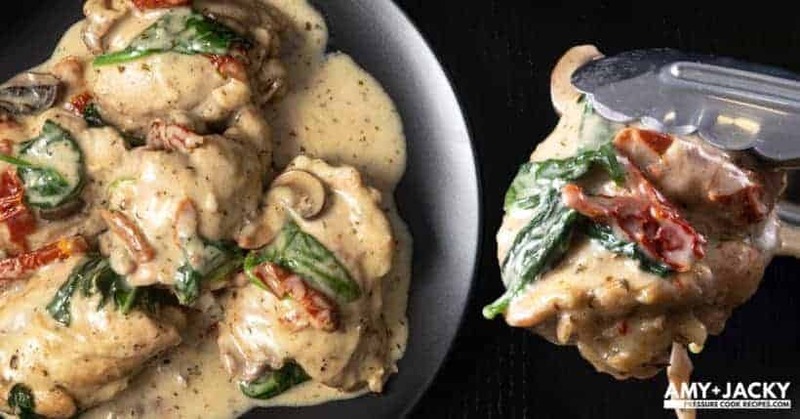 Boneless, skinless chicken thighs will work. I will recommend reducing the cooking time by a minute. Thank you for your response! It’s on my list of recipes to make. 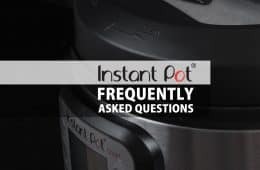 I love my Instant Pot and your recipes are delicious! looks great- super easy, this one is a must try!